The TSOP Fast Rope Unit is designed to work in conjunction with the platforms and allows personnel deployment when it is impossible to land the helicopter. The Fast-Rope Unit provides an overhead hook assembly that allows an easy transition from the helicopter to either fast rope or rappel. The hook is designed with a cable release to jettison the ropes once personnel are on the ground. This provides a“safe & clean”departure for the helicopter (no ropes attached). 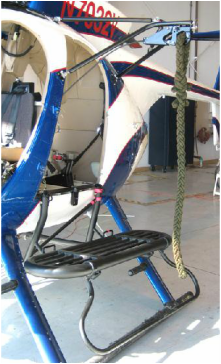 The Tyler Fast-Rope Hook can be re- leased from inside the helicopter by a manual two function T-handle cable release. The hook, which is specifical- ly designed for fast-rope operations, can be configured to “release under load” or “lock under load” providing agencies with a choice depending on their safety priorities.